Felaket Kurtarma ve İş Sürekliliği alanında; gerek iş hayatımda operasyonel olarak yaptığım çalışmalardan edinmiş olduğum deneyimler, gerekse Akademik olarak Master döneminde yapmış olduğum çalışmalardan edinmiş olduğum deneyimlerden harmanlayıp hazırlamış olduğum “Disaster Recovery Planning for Data Centers and IT Services” başlıklı makalem Aylık bilimsel makaleler yayınlayan IARJSET (International Advanced Research Journal in Science, Engineering and Technology) te geçtiğimiz yayınladı. Bu çalışmayı sizlerle paylaşmaktan büyük memnuniyet duymaktayım. In accordance with the technological developments in today’s world many companies implement their vital operations on their data centers and IT services.In connection with the fast development in technology and risimg complexity of business processes, the control of the systems and critical data that companies have, became more and more complicated. Therefore; it became an obligation for most companies to have a well-organized “Disaster Recovery Plan”. Today, together with the developments in Information and Communication Technologies, companies make investment on their IT services and data centers to provide fast and continuous services to their users and customers. They set up these data centers with the systems presenting the best services, the highest accessibility and again for these systems in order not to face with access problems there is an increasing investment for all IT structure. Companies need a well-arranged Disaster Recovery Plan for the continuity of their data centers, server systems and IT services to be able to manage the disaster recovery period effectively and to cut through the disaster with minimum data and economical loss; because in an emergency disaster situation they may lose access to some part of the system or all IT and server systems may be out of order. This article provides a guideline in planning IT processes showing up to date Disaster Recovery solutions, strategies and suggestions for an unexpected disaster situation to cope with the losses, discontinuities in data centers and IT services. Companies all over the world to be able to guarantee the business continuity became more and more dependent on IT industry. 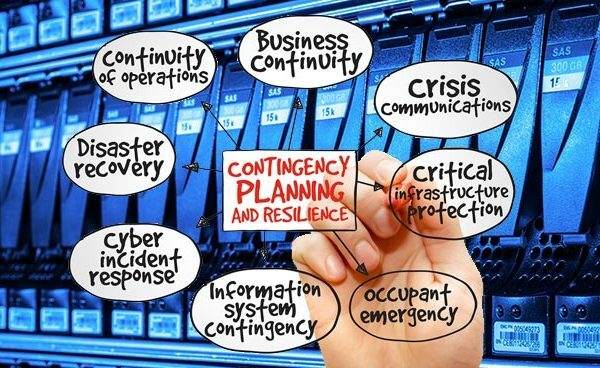 In an unexpected disaster situation, the systems that are directly depending on IT infrastructure, need high-level, intense studies; accordingly, it can be said that planning processes of business continuity directly effects all business processes. Business continuity plan, includes the occupations and processes that the company will prompt in a disaster situation. It includes the studies that will be carried out in an emergency situation to prevent the the possible damage on critical services and it aims to get over the crisis with a minimum loss and damage . Disaster recovery plan, on the other hand, includes planning, development, and evaluation studies and it provides the efficient and effective continuation of bussiness functions. Today, either for big or small companies it is a great need to have a disaster recovery plan. This plan needs to be as extensive as possible and it should provide the continuity of bussiness processes eliciting the starting of other critical processes within the shortest possible time. Besides, this plan must foreseen the storage and restoring of all data backups avoiding data losses . Instead of using a ready Disaster Recovery Plan, created for a special company, companies need to do analysis and choose the best fit disaster recovery processes and solutions for their own structures and prepare their own recovery plans. By the way; this will both create a better recovery management strategy for IT managers and the company will gain more benefits. Testing of Disaster Recovery Plan periodically. Immobilize your most critical applications and data: Companies need to decide which applications and data are most valuable for them, which ones are most critical and which data is valid for their customers, such as; internal accounts, financing etc. Virtualize your critical systems and applications: This is not only reduce your work intensity and costs but also make your environment more suitable for disaster recovery. Virtual environments are more useful and more easy to move. Virtualization; protecting individual components and animated parts, will diminish the complexity and will make recovery stages easy to manage . Immobilize your RPO(Recovery Point Objective) and RTO(Recovey Time Objective) values realistically: It should be decided before if which data can be lost, how long and when will the critical applications be online again after a disaster. Be sure that your objectives are realistic, attainable, and accurate. Create your data backup and recovery procedures: Decide your failover( a secondary system that takes the control in a disaster situation) and failback(recovering system and services back after a disaster)times and the conclusion will show you your protection level, your recovery speed and your expected costs. Keep your data and system backups up to date: In Disaster Recovery Center, data backup systems and in storage systems; backup your data frequently, by the way, in an unforeseen disaster stiuation you will have less data loss. Besides, you will meet your RTO assets with less effort. Automate your bussiness and operation processes: Don’t let human errors cut your way! If you do your automatical disaster plans thanks to the suitable automation, your disaster recovery will take minutes rather than weeks. This system eliminates many of the management problems for system users. Since network and virtual machine configurations have been made before, some processes like restarting of applicaiton can be done automatically. Plan your risk management accurately: Many lack of access problems faced in IT services are not called as a disaster; otherwise; they are caused by some faults in procedures. Prapare your procedures on how to update and upgrade the services and IT systems before the operations, then do your operations depending on these procedures. Give responsibilities: Give personal responsibilities for everyone in your team, be sure that each personal is ready to move and work in any critical situation. Prepare your Failback plan after a disaster: An experienced disaster and a disaster recovery made up can not create a whole disaster recovery plan. You need to plan your failback stages to reverse original operations of the systems after the disaster is over . Choose your solution partner: Agree wtih a firm that will support give technical assistance with your IT infrastracture and server systems. In an emergency stiuation, they will help you to recover quickly and manage the crisis situations. Identification of the risk that your company may face, is the major and the most important part of being ready for a disaster. In the list given you can find some basic IT problems that interrupts or prevents operations. Apart from these, other risk types can be classified as; intentioanal actions, infrastracture problem and environmetal disasters. Nearly all componies in the world ,if not all, face with any one of these problems. 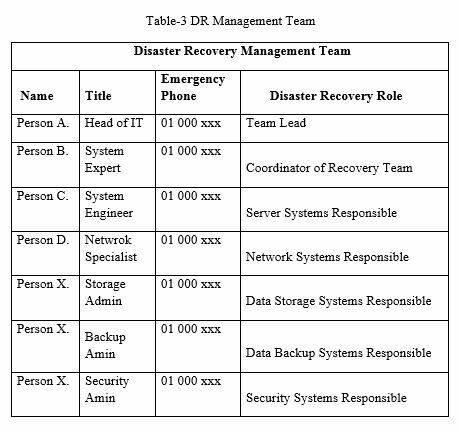 Disaster types are listed in Table-1. Your Disaster Recovery Plan must be qualified enough to make your all system and data operating again within the shortest possible time in any natural disaster or technical disaster situation. There are some standarts for the data centers that have a first rate importance for IT information industry. Among all these the most widely- accepted ones are TIER certifications. These certificates given by ‘uptime institute’ that evaluate data centers for their maintenance, management and design areas. After the evaluation, companies that have the announced values and assets are entitled to a TIER certification . Tier 0: It defines data centers with one site and they donot need any Disaster Recovery processes since in this tier there isnot any recorded data or documentation belong to the company so consequently there is no risk of emergency for the companies in this stage. 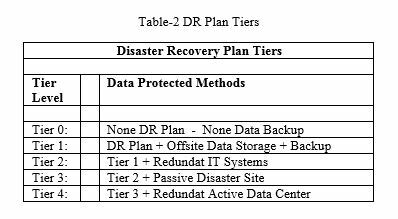 Tier 1: Companies that have IT services and data centers in this step, have a Disaster Recovery Plan and save and manage their data in an off-site storage site along with the main data center. Tier 2: This tier encloses all features of prior tier and besides all, for the IT services that serve for critical processes in data center, they host a reserve system, hardware and infrastructure resources that can be used in an emergency situations. Tier 3: Companies that have IT services and data centers in this tier have all features of tier 2 and add to these they have a secondary data center to which they continually transfer critical data. Tier 4: Tier 4 encompasses all the features of Tier3 and in addition, , for the IT services and critical data that serve for critical bussiness processes,they have a second data center with the same qualities of the main site. Therefore; some backup and migration processes are done in both of these centers. Within the formation stage of Disaster Recovery Plan for data centers and IT services, one of the most important steps is to make a disaster bussiness-impact analysis which includes the studies that show the foreseen negative effects of the disaster before it happens. While creating a Disaster Recovery Plan, RTO and RPO considered as an important criteria and requires an accurate planning. Recovery Time Objective: It is the guessed elapsed time that passes till all the processes come back to operating conditions again. The aim is that this time must be shorter than accepted lack of accessibility time . Necessary education should be given to the responsable recovery team. When the steps listed above are done completely , in an unexpected natural disaster, you could verify permanance of IT services and server systems with minimum data less abd lack of access . Another importatnt step in creating Disaster Recovery Plan is to designate Disaster Recovery management and operation teams to take over the control of crisis management actively in an unexpected crisis situation in which all server systems and critical bussiness services will be damaged. Throughout the creating process of bussiness continuity and Disaster Recovery planning,it is crucial step to choose the best solution conforming with the economical and technical structure of the company. While choosing a Disaster Recovery solution best fit with the data center and IT system architecture of the company,both the disasters that will come out of environmental reasonss and the ones caused by technological problems should be taken into consideration. If all the solutions listed above are planned after a fair business impact analysis, in an event of a disaster the company will be moved to the operatig conditions again without any data loss and access problems . It provides a good teaching and exercising material for the new starters. In today’s world with the developments on information and communucation technologies and companies’ expanding demand for data centers and IT systems, to be able to guarantee the bussiness continuity Disaster Recovery Plan became the most important building block of IT systems. Disaster Recovery Management, on the other hand, is no more a choice but an obligation for the companies that lay their services before their employers and customers from these data centers and IT systems. Disaster Recovery Plan; once more, has a vital importance for the services serving from data centers and IT systems in an event of an unexpected disaster since it provides the correct management of the processes and recovery of the services with minimum data loss and distruption. Bilişim Derneği, Türkiye. Kamu-Bib İş Sürekliliği Çalışma Grubu. Türkiye Bilişim Derneği. [Çevrimiçi] 2016. http://www.tbd.org.tr/usr_img/cd/kamubib17/AnaMenu.htm. Felaketten Kurtarma ve Depolama. Doğdu, Erdoğan ve Nihat, Yurt. Ankara : Türkiye Bilişim Derneği, 2009. Türkiye Bilişim Derneği, Kamu Bilişim Platformu XI Final Raporu. s. 21-36. Menken, Ivanka. Virtualization The Complete Cornerstone Guide to Virtualization Best Practices. basım yeri bilinmiyor : Emereo Pty Ltd., 2010. Buyya, Rajkumar ve Broberg, James. Cloud Computing: Principles and Paradigms. New Jersey : John Wiley & Sons Inc., 2011. Itadvisor. Tier 3 Veri Merkezi Standartlarını Belirliyor. itadvisor.com. [Çevrimiçi] 2012. http://itadvisor.com.tr/tier-3-veri-merkezinde-standartlari-belirliyor/. Dinç, Erdal. RTO ve RPO Nedir? Erdal Dinç Kişisel Web Sayfası. [Çevrimiçi] 2014. http://www.erdaldinc.com/recovery-point-objectiverpo-ve-recovery-time-objectiverto-nedir/. Akpınar, Haldun. Prof. Dr. Haldun Akpınar. Enformasyon Teknolojisi ve İşletmecilik Öğretimine Etkileri. [Çevrimiçi] 2015. http://haldunakpinar.com/yayinlar.htm. Çözümpark, Bilişim Topluluğu. Storage üniteleri arasında data mirror. Çözümpark. [Çevrimiçi] 2015. https://www.cozumpark.com/blogs/default.aspx. Yasin Akıllı, is still working as a System Virtualization Admin in Avea Iletisim A.S. , he has been carrying on studies about Backup and Storage Administration and Disaster Recovery. He has been working on ITindustry as a System Engineer for about 10 years. He has completed Microsoft System Engineer certifications and got the title of MCITP. He has a Master’s Degree in Computer Engineering at Istanbul Aydın University. You can download the original edition of the article from the link below. your welcome Jack, thank you for comment.